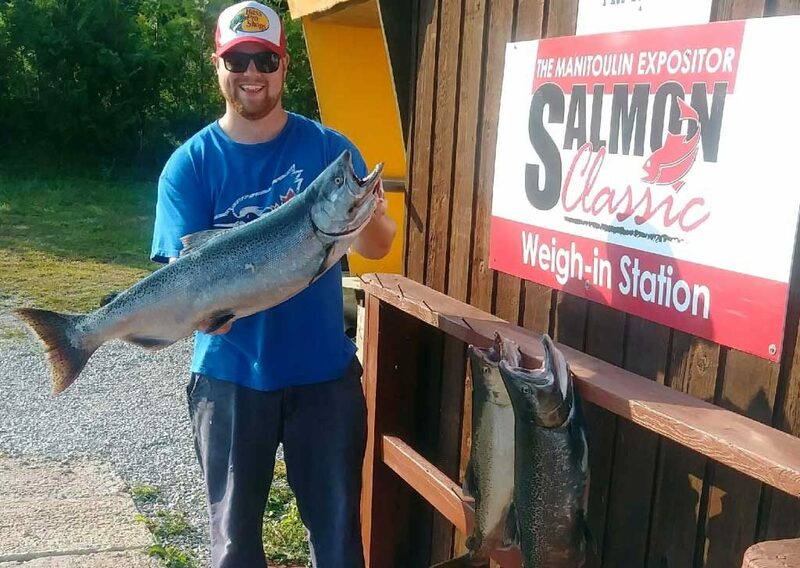 We are in for a fast and crazy finish to The Manitoulin Expositor Salmon Classic this year. The weather looks to be cooperating, finally, and the weigh ins are rolling in from the south shore. It has been a very challenging past few days’ weather wise, but according to reports, the fish are stacked in Michaels Bay and Providence Bay like cord wood. I have not been out since Sunday night, and I am looking forward to finishing strong Friday night and Saturday morning, so you will have at least two more chances to out fish me. I did manage to have a little walk down the Manitou River by the falls this week and spotted lots of fish in the river. I notice one brute of a female that would surely top 25 pounds. You are not safe yet Jesse! You have today and tomorrow (Friday) to topple Ray Beaudry and his 19.31 lb salmon of the week and the $1,000 that goes along with it. I know Ray, and I bet he checks the leaderboard hourly! I had a text from yesterday’s winner, and he informed me that 17-20’ on the ball in 32-35’ of water is working for him using a watermelon spoon. Heading into the final weekend with so many fish around be sure to test your gear and sharpen your hooks before you head out. I have heard several reports this year of failed clips and O rings, with big fish now readily available and money on the line it would be a shame to lose the big one to a $2 clip. We will have a massive influx of people fishing this weekend around the Island; please be patient and courteous. Not everyone is a pro at launching their boat, instead of getting mad give them some help, it goes a long way in promoting the sport of fishing when you lend a hand. A pet peeve of mine is cutting someone’s bait trail (Aussie Term), it means, please don’t troll in anyone’s wake. There is lots of water out there and you will have more luck of you find a quiet bit of water to troll anyway. Just because someone just caught a fish does not mean you have to immediately troll over to the location, chances are you will not catch a fish there anyway. Last but certainly not least, when you see a boat fighting a fish give them lots of room, as we all know a big salmon will go on huge runs and nothing is more frustrating than losing a fish because you became entangled in a passing boat. This will be my final report of the derby; I am looking forward to meeting everyone at the wrap-up event at John Budd Park in South Baymouth starting at 3:00 pm on Sunday. Good luck out there and have fun!